Gloves in a bottle helps repair hands. 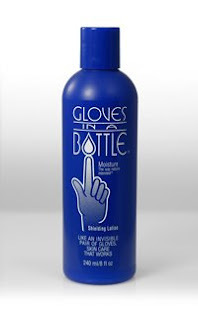 If they are dry, have lines, or if you have rash problems, Gloves in a bottle will help. When you use it you need to wash your hands first. The reason being is that Gloves in a bottle keeps good in and the bad out. So, if your hands are dirty, you are keeping dirt on your hands, YUCK! Wash your hands! This process helps keep moisture in and all of the toxins that make your skin dry or damaged out. Thus, Gloves in a bottle, is like wearing an invisible glove. I do like it. I didn’t like the smell at first; but I think it must have been something else in the house or something else on my hand because I didn’t notice it after that first use. It kept my hands soft. I just have to use it every day. I’m still hoping for that miracle one time use product that will keep my hands soft, itch free, scar free and chemical free. Would you like to sample Gloves in a Bottle? If you are a blogger and would like to write a review, leave a comment with your e-mail address and I will forward their information to you. They are still looking for reviewers. If you are not a blogger, I have three SAMPLE size samples to give away. I will mail them out next week, just leave a comment along with your e-mail address so that I can contact the three people to send the samples too. CHECK BACK EVERY DAY THIS WEEK FOR A NEW GIVEAWAY! i’d love to try the samples – this sounds fantastic! with winter coming up my skin’s going to get so dry. I would love to do a review–my hands get sooo dry and cracked in the winter! I always wanted to try this. I have heard that it is good to use when making jewelry, to keep your fingers from getting poked a lot with wires. Also I wonder if it is good for when working with a lot of papers and the paper dries out your hands. I”m not a blogger but would love to try a sample. I could really use this for both my hands and feet! I blog on MySpace, otherwise a sample will be great, too! My hands definitely could use this! I would love to write a review about the product if they are still looking for people to try it! I’d love to try out a sample of this lotion. So far the only lotion that seems to wrok for my hands is Cornhuskers, but I’m always game to try something different to see if it’d work!! I would love to try it out. I am a cook in a family run resteraunt and I am constantly washing my hands due to food, and when i use gloves the powder in the gloves dont agree with my skin either!! I would love to prevent them cracking and being sore especially in winter! I would love to do a review. I love their stuff!!! I posted a review on it a while back. I love it!!!!! I would love to give this a try and blog about it! This is definitely something that will come in handy this winter! This sounds awesome! I'm the sole dish washer in the house & my hands are in sad sorry shape! This sounds like it could be really useful! i would love to try this out…we have cold, dry winters and i’m still looking for the perfect hand moisturizer! Since I was a litte girl I couldn’t stand to have dirty hands and still run to wash them right away. This would sure save my skin. Thanks so much for the chance! I have heard great things about this product and have been dying to try it and can’t find it!! i would love to have this for the winter! I would like some info about doing a review. I think this would be great for my daughter. Her hands are really in bad shape. How awesome! Thank you so much! I’d really like to try this sample. Neat concept for a product. This sounds like something I could really use. I’d like to try a sample or maybe a review. please, count me in. thank you. I have heard good thigs about this product. I would love to try it. I would love to try this product. My hands get really dry in the winter and this looks like a great product to use for it. Thanks!! I’d love to do a review if you’re still looking for people! We are in IL and my oldest son (6) always gets horribly cracked hands in the winter.